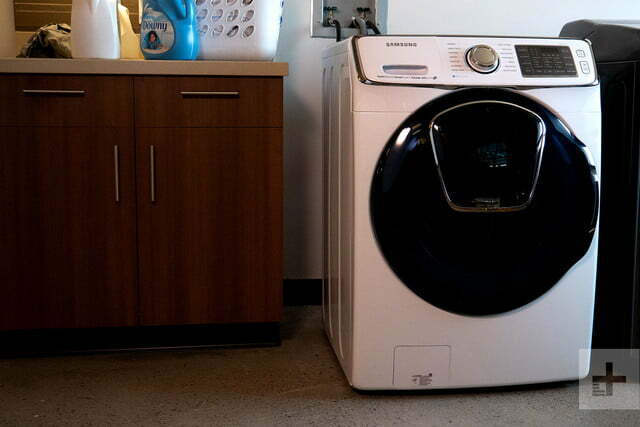 This easy-to-use washing machine looks good in a laundry room and handles big loads with style. How often have you started a load of laundry, only to find a stray sock or shirt that you need to add to the load? Either you stop the load and throw it in, or that sad little sock must wait for the next load. 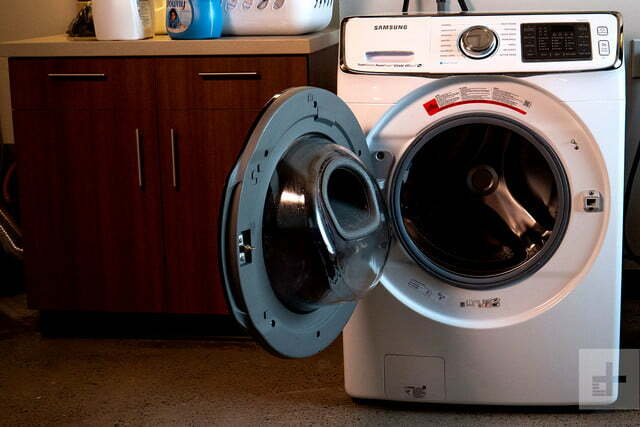 If this happens to you, the Samsung 5.0 cubic feet AddWash front load washer just may be the machine you’ve been waiting for. 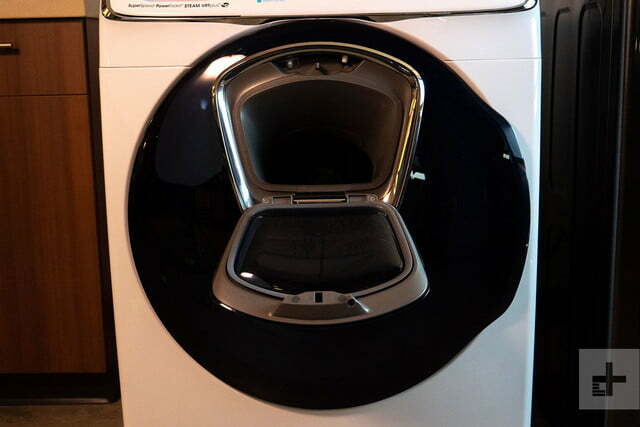 The front panel has a small door that you can quickly open and throw in that forgotten piece of laundry while the machine is running. That’s not the only thing we like about this machine: Its controls are straight forward and easy to use. We just wish it washed clothes a little bit faster. Read on to find out more. The charcoal (also available in white) washing machine looks like something you’d see in a model home and gives off an air of being able to get things done. The machine is a bit of a behemoth, measuring 38.75 inches high by 27 inches wide by 34 inches deep. 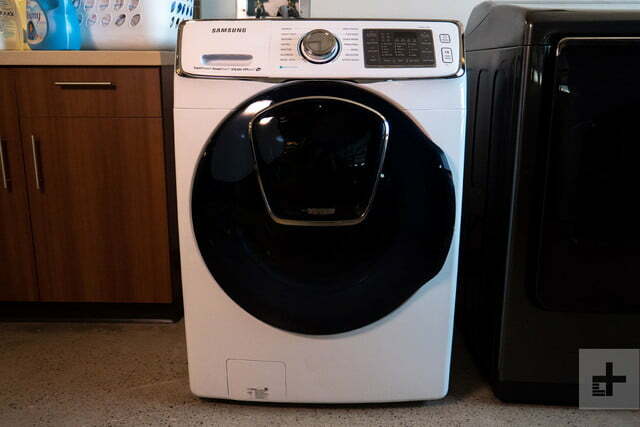 It will take up a bit of space in a laundry room, and its companion dryer, the Samsung DV8750, is about the same size. The gray color and bluish tint on the plastic gray front door makes it a stylish addition to a home. What we really appreciated is the control panel. It’s not littered with too many buttons, making it easy to operate out of the box. About one-third of the front control panel above the front door is a dedicated drawer for adding detergent, bleach, and fabric softener. The other two thirds of the panel house a control nob to select a cycle, and a button panel where you can fine-tune how a load gets washed. 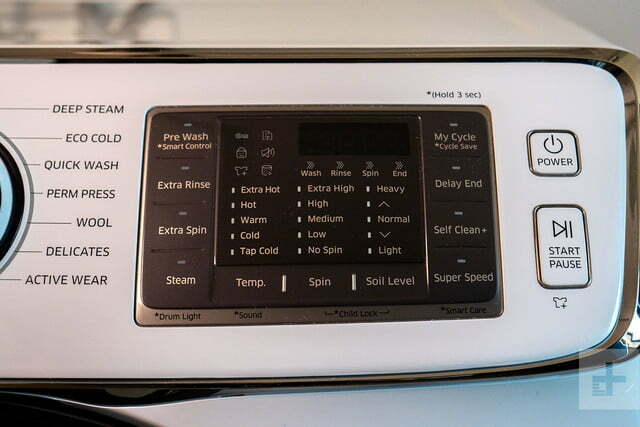 Before selecting any cycles, you’ll need to press the power button. The machine doesn’t automatically turn on when you put clothes in and shut the door. Forget an item? No problem, just press open the tiny door on the front load panel and drop it in. 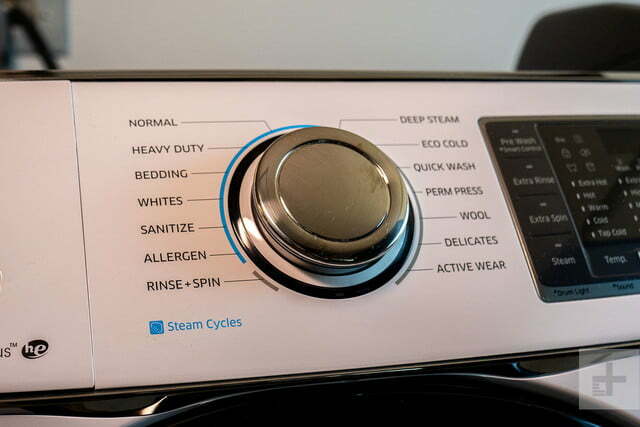 The cycle selector includes options for Normal, Heavy Duty, Bedding, Whites, Sanitize, Allergen, Rinse+Spin, Deep Steam, Eco Cold, Quick Wash, Perm Press, Wool, Delicates, and Active Wear. Depending on the cycle you choose, you can also make modifications, like adding a pre-wash, extra rinse and spin, and steam. You can customize the water temperature (Extra Hot, Hot, Warm, Cold, and Tap Cold), spin (Extra High, High, Medium, Low, and No Spin), and the soil level (Heavy, Normal, and Light). The digital display pad shows the current cycle details, illuminating relevant icons, and estimated time the load will take to complete. You can also delay ending the cycle, run the self-clean option, or up the speed with the Super Speed Option. Though in our tests, this option didn’t do much to expedite washing clothes. There’s also an option for “My Cycle,” which is something you can set in the Samsung Smart Home app that’s available for both Android and iOS devices. However, you’ll need to get the Smart Home Adapter (about the size of a standard USB thumb drive), which plugs into a USB port on top of the machine. 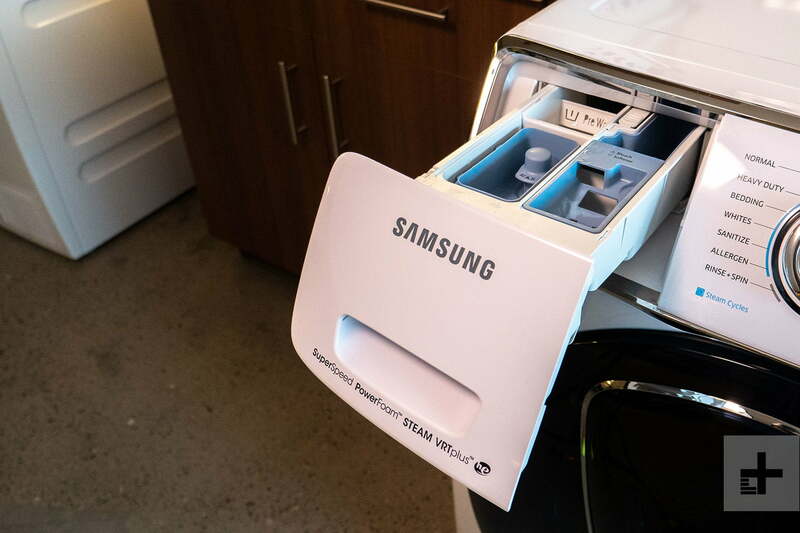 Even though we didn’t have the adapter and couldn’t test this feature, we particularly liked the way Samsung implemented Wi-Fi into this machine, essentially providing its own router, which should make connecting to the app a painless process. 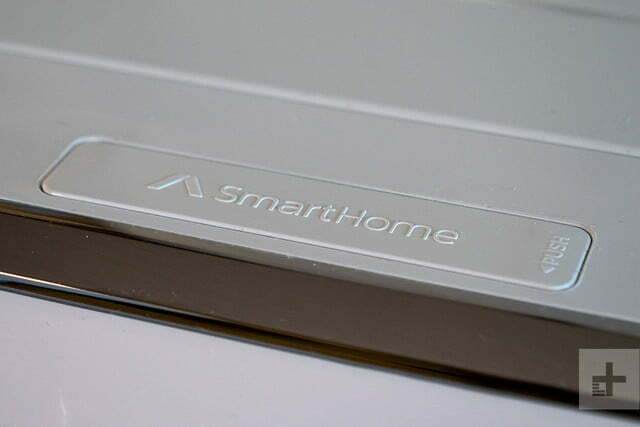 That hasn’t always been the experience we’ve had testing other Wi-Fi-enabled appliances. 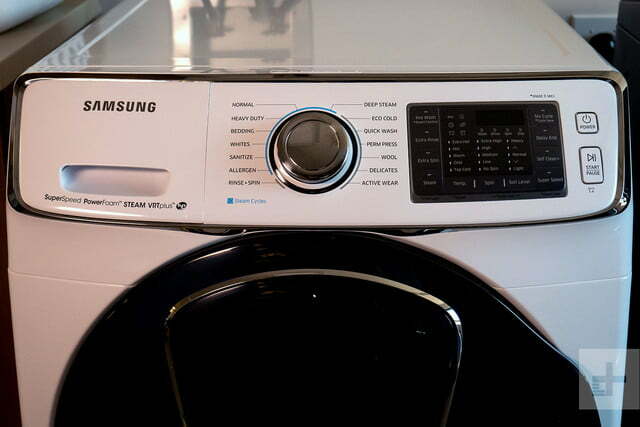 This Samsung washing machine is insanely easy to use. Just about anyone in your family tall enough to reach the controls should be able to run a load. Once you load the machine, press the power button, select your settings, and press the Start/Pause button (it’s got a play button icon). This action locks the main door and starts the cycle. Forget an item? No problem, just press open the tiny door on the front load panel and drop it in. The only time this option doesn’t work is when the machine is toward the end of a cycle, which you wouldn’t want to add laundry to anyway. We washed a variety of loads over a couple of months and were fairly satisfied with the results. In fact, one of our coworkers only stopped bringing in his laundry because he got a washing machine at home, but noted that he liked this model better. To put it to the official test, we did two loads of stained items on different settings. The first load was filled with two summer blankets for a king size bed. The blankets had a variety of stains on them that came from a dog licking them. For the other load, we soiled clothing with olive oil, coffee, and barbeque sauce, and left it out for two hours to fully set into the fabric. The control panel doesn’t suffer from the typical littering of too many wash options, making it easy to use out of the box. The first load of blankets we washed on Bedding (which is a steam cycle), Extra Hot, and Heavy Soil. We didn’t pretreat any of the stains before washing. When we heard that familiar Samsung tune alerting us that the load was finally finished, we found the results were a bit of mixed bag. While many of the stains were gone, there were still a few that were lighter but clearly visible. The steam was supposed to help get a lot of the stains out. We washed the second load using the Quick Wash cycle, Hot Water, and Heavy Soil, and while it did manage to get most of the stains out, there were still a few remnants that remained here and there. Still, we were impressed at how many it got out without the steam or without applying a stain remover. The biggest issue we encountered was that the time remaining shown on the display didn’t align with when the load was done. So initially, the machine might say that the load would be complete in an hour and 18 minutes, and it ended up taking about ten to 20 minutes longer. That’s probably not a big deal for you if tend to start a load of laundry and then switch it to the dryer when you get around to it. 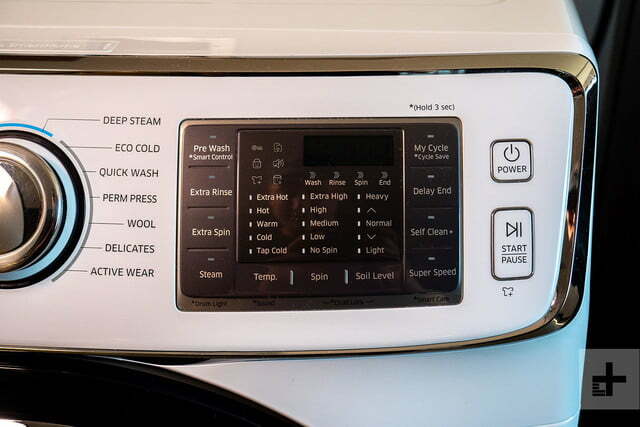 However, if you’re looking for something that will quickly wash a soccer uniform, you won’t be able to count on the timer to give you a reliable estimation of when the load will be done. 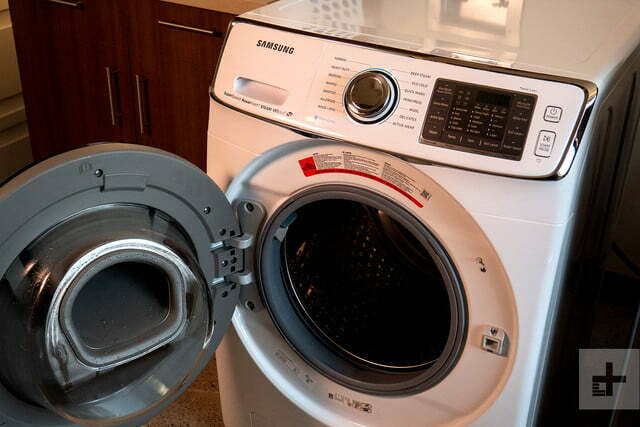 This Samsung washer comes with a warranty that covers parts and labor for one year. The stainless tub is covered for three years, and the motor for ten years. 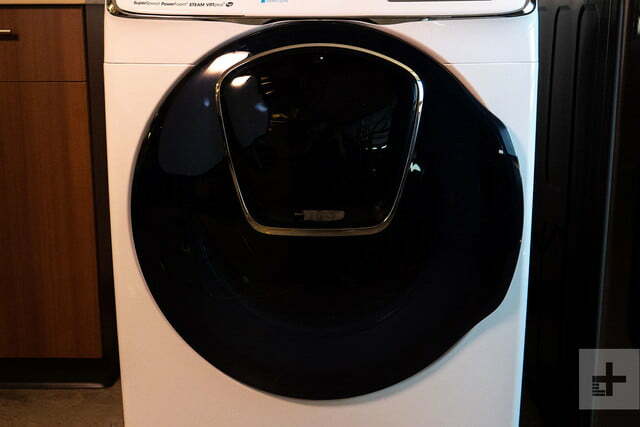 Overall, the Samsung WF7500 is a solid machine that would make a good addition to any family home, as it really can handle a lot of laundry at once. We would recommend using a stain remover on heavily soiled items. That said, the machine is easy to use and will make just about any laundry room just a little bit more attractive. 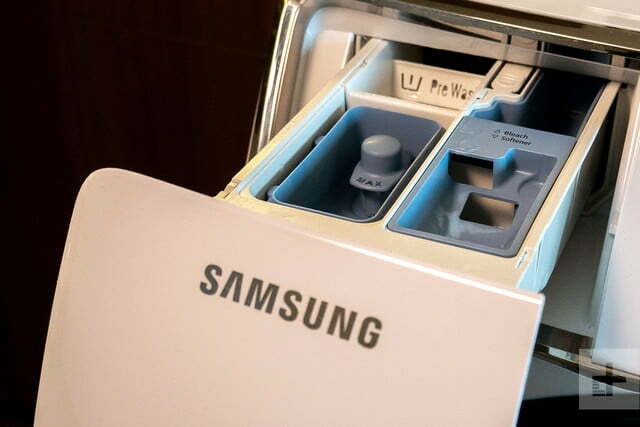 Though more expensive, the Samsung WV9900 FlexWash is a two-in-one washing machine that offers a bit more flexibility, allowing you to wash a smaller load without needing to fill an entire big bin. 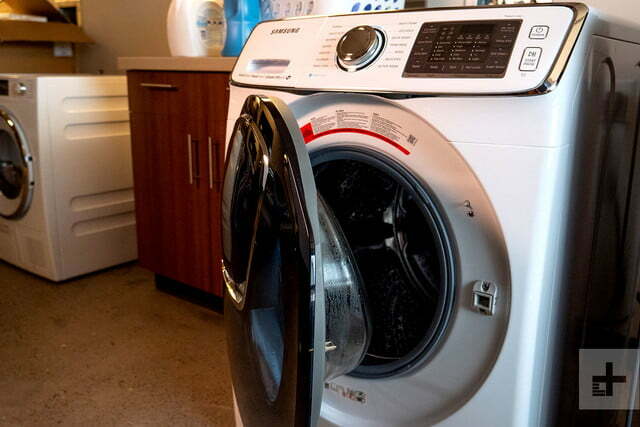 You can also check out our guide to the best washing machines. 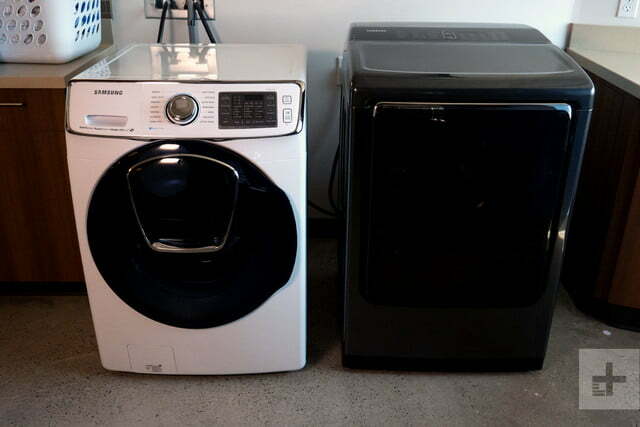 Top loaders typically have a longer life than front load washing machines. Still, according to the experts, this front loader model should last between 10 to 14 years, and probably closer to 10 than 14. This is a solid option for a large family who needs a reliable machine that can handle double loads and bulky items with ease. At just about $1,000 (depending on the color), it’s a fair price for what it can do. On the other hand, if you don’t do a lot of laundry frequently, there are many other models available that are more affordable and will take up less room in your home.